Unfortunately, the dress you are looking for (Style: AS-i745056a35, Name: AS-i745056a35) is no longer available. 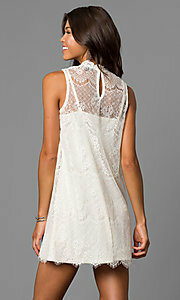 Here's a lovely short lace graduation party dress that looks sweet for family celebrations. This delightful shift dress has a delicate sleeveless lace overlay with a scalloped design on the high neck and short hemline. Thin spaghetti straps adjust for a comfortable fit on the coordinating mini lining that is visible through the beautiful lace overlay. 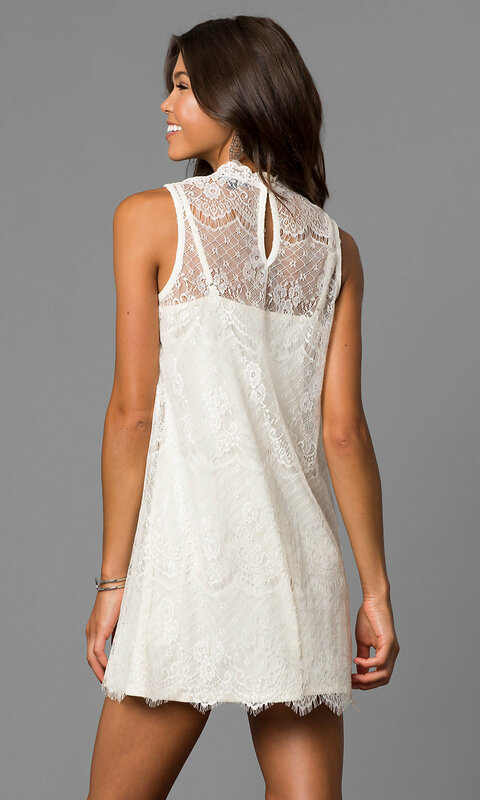 A flirty back keyhole completes the look of this pretty semi-formal dress. Under $100 for commencement or a rehearsal dinner, this versatile short lace graduation party dress by the designers at As U Wish is a bargain for your special night. 30", Hollow to Hem 27"